The Glasgow Centre for Population Health generates insights and evidence and supports new approaches to improve health and tackle inequality. 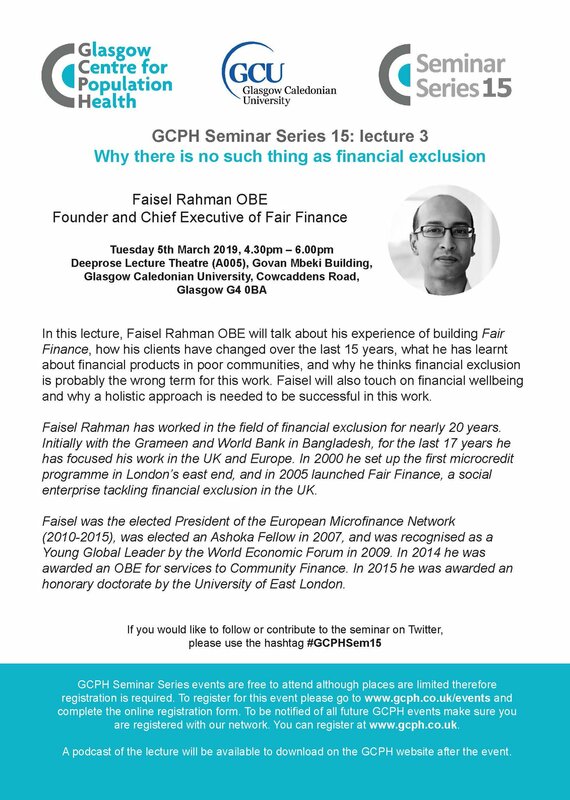 They hold an annual lecture series and this year invited Fair Finance’s founder and CEO to speak on financial exclusion. 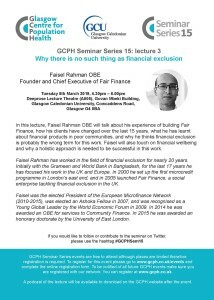 In this lecture, Faisel shared his experience of building Fair Finance, innovating a range of financial products for marginalised communities and how the clients and issues have changed over the last 15 years. He talked about the importance of understanding the customer, their choices, and their needs to help inform what you do. He explained also why he thinks there is no such thing as financial exclusion, and why the phrase limits our ability to understand the issue and address the real problems experienced by many low and moderate income communities in the UK.